While the AC has become a necessity and thus commonly found in most households, it has a tendency of increasing the utility bills. Hence people today are looking at options which can lower the same yet give them the same comfort. The inverter AC is one such option which, by virtue of being much more energy efficient, helps to reduce the utility bills. Capacity: Here too the capacity of the AC purchased depends on the area of the room it needs to cool. Since it facilitates faster cooling due to the presence of a compressor which is always running, the capacity should be calculated taking this into account. Another very important point to be taken into consideration is the fact that if a room requires a normal AC of 1.5 ton capacity, an inverter AC will be able to achieve that with the help of a 1tonne capacity AC machine. Coil make: The material making up the coil has a role to play in the selection of an inverter AC. Since this AC cools faster taking much less time to achieve the desired temperature, all its inherent parts must work in tandem. Thus the presence of copper coils with their higher conductivity helps to enhance the cooling rate and is of greater advantage than an AC with aluminium coils. Energy efficiency: Inverter ACs were made to be much more energy efficient. They do this by reducing the power consumed in cooling the room. This consumption gets reduced because of the presence of a flexible compressor which adjusts its speed depending on the heat load factor of a room. Statistics prove that an inverter AC with a 3 star rating is about 7% more energy efficient than a 5 star normal AC. Noise: Even though the compressor is always switched on, there is hardly any noise that can be heard by the people in the room. This reduction in noise enables people to have a good sleep or to have a peaceful and comfortable stay in the same. The cost of an inverter AC is much more than even a 5 start AC. In fact inverter ACs start from about INR 39000 or about INR40000. With addition of extra features and a rise in the capacity, the price also keeps increasing considerably. 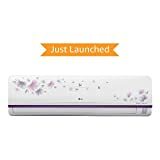 But since after its initial cost, it helps to bring about a noticeable reduction in the monthly house electricity bills over a period of time; this AC is definitely worth a buy as it offers value for money.